"EFTA" redirects here. For other uses, see EFTA (disambiguation). Note: Iceland observes WET all year, while Liechtenstein, Norway, and Switzerland observe CET and CEST. The European Free Trade Association (EFTA) is a regional trade organization and free trade area consisting of four European states: Iceland, Liechtenstein, Norway, and Switzerland. The organization operates in parallel with the European Union (EU), and all four member states participate in the European Single Market and are part of the Schengen Area. They are not, however, party to the European Union Customs Union. EFTA was historically one of the two dominant western European trade blocs, but is now much smaller and closely associated with its historical competitor, the European Union. It was established on 3 May 1960 to serve as an alternative trade bloc for those European states that were unable or unwilling to join the then European Economic Community (EEC), which subsequently became the European Union. 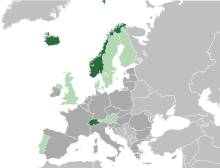 The Stockholm Convention, to establish the EFTA, was signed on 4 January 1960 in the Swedish capital by seven countries (known as the "outer seven": Austria, Denmark, Norway, Portugal, Sweden, Switzerland and the United Kingdom). Since 1995, only two founding members remain, namely Norway and Switzerland. The other five, Austria, Denmark, Portugal, Sweden and the United Kingdom, have joined the EU in the intervening years. The initial Stockholm Convention was superseded by the Vaduz Convention, which aimed to provide a successful framework for continuing the expansion and liberalization of trade, both among the organization's member states and with the rest of the world. Whilst the EFTA is not a customs union and member states have full rights to enter into bilateral third-country trade arrangements, it does have a coordinated trade policy. As a result, its member states have jointly concluded free trade agreements with the EU and a number of other countries. To participate in the EU's single market, Iceland, Liechtenstein, and Norway are parties to the Agreement on a European Economic Area (EEA), with compliances regulated by the EFTA Surveillance Authority and the EFTA Court. Switzerland has a set of bilateral agreements with the EU instead. On 12 January 1960, the Treaty on the European Free Trade Association was initiated in the Golden Hall of the Prince's Palace of Stockholm. This established the progressive elimination of customs duties on industrial products, but did not affect agricultural or fisheries products. The main difference between the early EEC and the EFTA was that the latter did not operate common external customs tariffs unlike the former: each EFTA member was free to establish its individual customs duties against, or its individual free trade agreements with, non-EFTA countries. The founding members of the EFTA were: Austria, Denmark, Norway, Portugal, Sweden], Switzerland, and the United Kingdom. During the 1960s, these countries were often referred to as the "Outer Seven", as opposed to the Inner Six of the then European Economic Community (EEC). Finland became an associate member in 1961 and a full member in 1986, and Iceland joined in 1970. The United Kingdom and Denmark joined the EEC in 1973 and hence ceased to be EFTA members. Portugal also left EFTA for the European Community in 1986. Liechtenstein joined the EFTA in 1991 (previously its interests had been represented by Switzerland). Austria, Sweden, and Finland joined the EU in 1995 and thus ceased to be EFTA members. Twice, in 1973 and in 1995, the Norwegian government had tried to join the EU (still the EEC, in 1973) and by doing so, leave the EFTA. However, both the times, the membership of the EU was rejected in national referenda, keeping Norway in the EFTA. Iceland applied for EU membership in 2009 due to the 2008–2011 Icelandic financial crisis, but has since dropped its bid. Between 1994 and 2011, EFTA memberships for Andorra, San Marino, Monaco, the Isle of Man, Turkey, Israel, Morocco, and other European Neighbourhood Policy partners were discussed. A Sectoral Approach with separate agreements with each state covering an entire policy area. A comprehensive, multilateral Framework Association Agreement (FAA) with the three states. However, the Commission argued that the sectoral approach did not address the major issues and was still needlessly complicated, while EU membership was dismissed in the near future because "the EU institutions are currently not adapted to the accession of such small-sized countries". The remaining options, EEA membership and a FAA with the states, were found to be viable and were recommended by the Commission. In response, the Council requested that negotiations with the three microstates on further integration continue, and that a report be prepared by the end of 2013 detailing the implications of the two viable alternatives and recommendations on how to proceed. As the EEA memberships are currently only open to the EFTA or EU members, the consent of the existing EFTA member states is required for the microstates to join the EEA without becoming members of the EU. In 2011, Jonas Gahr Støre, then Foreign Minister of Norway which is an EFTA member state, said that EFTA/EEA membership for the microstates was not the appropriate mechanism for their integration into the internal market due to their different requirements from those of large countries such as Norway, and suggested that a simplified association would be better suited for them. Espen Barth Eide, Støre's successor, responded to the Commission's report in late 2012 by questioning whether the microstates have sufficient administrative capabilities to meet the obligations of EEA membership. However, he stated that Norway was open to the possibility of EFTA membership for the microstates if they decide to submit an application, and that the country had not made a final decision on the matter. Pascal Schafhauser, the Counsellor of the Liechtenstein Mission to the EU, said that Liechtenstein, another EFTA member state, was willing to discuss EEA membership for the microstates provided their joining, did not impede the functioning of the organization. However, he suggested that the option direct membership in the EEA for the microstates, outside of both the EFTA and the EU, should be considered. On 18 November 2013, the EU Commission concluded that "the participation of the small-sized countries in the EEA is not judged to be a viable option at present due to the political and institutional reasons," and that, Association Agreements were a more feasible mechanism to integrate the microstates into the internal market. The Norwegian electorate had rejected treaties of accession to the EU in two referendums. At the time of the first referendum in 1972, their neighbour, Denmark joined. Since the second referendum in 1994, two other Nordic neighbours, Sweden and Finland, have joined the EU. The last two governments of Norway have not advanced the question, as they have both been coalition governments consisting of proponents and opponents of EU membership. Since Switzerland rejected the EEA membership in a referendum in 1992, more referendums on EU membership have been initiated, the last time being in 2001. These were all rejected. Switzerland has been in a customs union with fellow EFTA member state and neighbour Liechtenstein since 1924. On 16 July 2009, the government of Iceland formally applied for the EU membership, but the negotiation process had been suspended since mid-2013, and in 2015 the foreign ministers wrote to withdraw its application. In mid-2005, representatives of the Faroe Islands raised the possibility of their territory joining the EFTA. According to Article 56 of the EFTA Convention, only states may become members of the EFTA. The Faroes are a constituent country of the Kingdom of Denmark, and not a sovereign state in their own right. Consequently, they considered the possibility that the "Kingdom of Denmark in respect of the Faroes" could join the EFTA, though the Danish Government has stated that this mechanism would not allow the Faroes to become a separate member of the EEA because Denmark was already a party to the EEA Agreement. The Faroes already have an extensive bilateral free trade agreement with Iceland, known as the Hoyvík Agreement. The United Kingdom was a co-founder of EFTA in 1960, but ceased to be a member upon joining the European Economic Community. The country held a referendum in 2016 on withdrawing from the EU (popularly referred to as "Brexit"), resulting in a 51.9% vote in favour of withdrawing. A 2013 research paper presented to the Parliament of the United Kingdom proposed a number of alternatives to EU membership which would continue to allow it access to the EU's internal market, including continuing EEA membership as an EFTA member state, or the Swiss model of a number of bilateral treaties covering the provisions of the single market. In the first meeting since the Brexit vote, EFTA reacted by saying both that they were open to a UK return, and that Britain has many issues to work through. The president of Switzerland Johann Schneider-Ammann stated that its return would strengthen the association. However, in August 2016 the Norwegian Government expressed reservations. Norway's European affairs minister, Elisabeth Vik Aspaker, told the Aftenposten newspaper: "It’s not certain that it would be a good idea to let a big country into this organization. It would shift the balance, which is not necessarily in Norway’s interests." In late 2016, the Scottish First Minister said that her priority was to keep the whole of the UK in the European single market but that taking Scotland alone into the EEA was an option being "looked at". 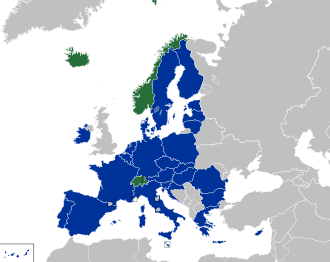 However, other EFTA states have stated that only sovereign states are eligible for membership, so it could only join if it became independent from the UK, unless the solution scouted for the Faroes in 2005 were to be adopted (see above). In early 2018, British MPs Antoinette Sandbach, Stephen Kinnock and Stephen Hammond all called for the UK to rejoin EFTA. EFTA is governed by the EFTA Council and serviced by the EFTA Secretariat. In addition, in connection with the EEA Agreement of 1992, two other EFTA organisations were established, the EFTA Surveillance Authority and the EFTA Court. The EFTA Council is the highest governing body of EFTA. The Council usually meets eight times a year at the ambassadorial level (heads of permanent delegations to EFTA) and twice a year at Ministerial level. In the Council meetings, the delegations consult with one another, negotiate and decide on policy issues regarding EFTA. Each Member State is represented and has one vote, though decisions are usually reached through consensus. The Council discusses substantive matters, especially relating to the development of EFTA relations with third countries and the management of free trade agreements, and keeps under general review relations with the EU third-country policy and administration. It has a broad mandate to consider possible policies to promote the overall objectives of the Association and to facilitate the development of links with other states, unions of states or international organisations. The Council also manages relations between the EFTA States under the EFTA Convention. Questions relating to the EEA are dealt with by the Standing Committee in Brussels. The day-to-day running of the Secretariat is headed by the Secretary-General, Henri Gétaz, who is assisted by two Deputy Secretaries-General, one based in Geneva and the other in Brussels. The three posts are shared between the Member States. The division of the Secretariat reflects the division of EFTA's activities. The Secretariat employs approximately 100 staff members, of whom a third are based in Geneva and two thirds in Brussels and Luxembourg. The Headquarters in Geneva deals with the management and negotiation of free trade agreements with non-EU countries, and provides support to the EFTA Council. In Brussels, the Secretariat provides support for the management of the EEA Agreement and assists the Member States in the preparation of new legislation for integration into the EEA Agreement. The Secretariat also assists the Member States in the elaboration of input to EU decision making. The two duty stations work together closely to implement the Vaduz Convention's stipulations on the intra-EFTA Free Trade Area. The EFTA Statistical Office in Luxembourg contributes to the development of a broad and integrated European Statistical System. The EFTA Statistical Office (ESO) is located in the premises of Eurostat, the Statistical Office of the European Union in Luxembourg, and functions as a liaison office between Eurostat and the EFTA National Statistical Institutes. ESO's main objective is to promote the full inclusion of the EFTA States in the European Statistical System, thus providing harmonised and comparable statistics to support the general cooperation process between EFTA and the EU within and outside the EEA Agreement. The cooperation also entails technical cooperation programmes with third countries and training of European statisticians. The EFTA Secretariat is headquartered in Geneva, Switzerland, but also has duty stations in Brussels, Belgium and Luxembourg City, Luxembourg. The EFTA Surveillance Authority has its headquarters in Brussels, Belgium (the same location as the headquarters of the European Commission), while the EFTA Court has its headquarters in Luxembourg City (the same location as the headquarters of the European Court of Justice). In 1992, the EFTA and the EU signed the European Economic Area Agreement in Oporto, Portugal. However, the proposal that Switzerland ratify its participation was rejected by referendum. (Nevertheless, Switzerland has multiple bilateral treaties with the EU that allow it to participate in the European Single Market, the Schengen Agreement and other programmes). Thus, except for Switzerland, the EFTA members are also members of the European Economic Area (EEA). The EEA comprises three member states of the European Free Trade Association (EFTA) and 28 member states of the European Union (EU), including Croatia which is provisionally applying the agreement pending its ratification by all EEA countries. It was established on 1 January 1994 following an agreement with the European Community (which had become the EU two months earlier). It allows the EFTA-EEA states to participate in the EU's Internal Market without being members of the EU. They adopt almost all EU legislation related to the single market, except laws on agriculture and fisheries. However, they also contribute to and influence the formation of new EEA relevant policies and legislation at an early stage as part of a formal decision-shaping process. One EFTA member, Switzerland, has not joined the EEA but has a series of bilateral agreements, including a free trade agreement, with the EU. The following table summarises the various components of EU laws applied in the EFTA countries and their sovereign territories. Some territories of EU member states also have a special status in regard to EU laws applied as is the case with some European microstates. A Joint Committee consisting of the EEA States plus the European Commission (representing the EU) has the function of extending relevant EU law to the non EU members. An EEA Council meets twice yearly to govern the overall relationship between the EEA members. Rather than setting up pan-EEA institutions, the activities of the EEA are regulated by the EFTA Surveillance Authority and the EFTA Court. The EFTA Surveillance Authority and the EFTA Court regulate the activities of the EFTA members in respect of their obligations in the European Economic Area (EEA). Since Switzerland is not an EEA member, it does not participate in these institutions. The EFTA Surveillance Authority performs a role for EFTA members that is equivalent to that of the European Commission for the EU, as "guardian of the treaties" and the EFTA Court performs the European Court of Justice-equivalent role. The original plan for the EEA lacked the EFTA Court or the EFTA Surveillance Authority: the European Court of Justice and the European Commission were to exercise those roles. However, during the negotiations for the EEA agreement, the European Court of Justice informed the Council of the European Union by way of letter that it considered that it would be a violation of the treaties to give to the EU institutions these powers with respect to non-EU member states. Therefore, the current arrangement was developed instead. The EEA and Norway Grants are the financial contributions of Iceland, Liechtenstein and Norway to reduce social and economic disparities in Europe. They were established in conjunction with the 2004 enlargement of the European Economic Area (EEA), which brought together the EU, Iceland, Liechtenstein and Norway in the Internal Market. In the period from 2004 to 2009, €1.3 billion of project funding was made available for project funding in the 15 beneficiary states in Central and Southern Europe. The EEA and Norway Grants are administered by the Financial Mechanism Office, which is affiliated to the EFTA Secretariat in Brussels. EFTA also originated the Hallmarking Convention and the Pharmaceutical Inspection Convention, both of which are open to non-EFTA states. EFTA has several free trade agreements with non-EU countries as well as declarations on cooperation and joint workgroups to improve trade. Currently, the EFTA States have established preferential trade relations with 24 states and territories, in addition to the 28 member states of the European Union. EFTA's interactive Free Trade Map gives an overview of the partners worldwide. EFTA member states' citizens enjoy freedom of movement in each other's territories in accordance with the EFTA convention. EFTA nationals also enjoy freedom of movement in the European Union (EU). EFTA nationals and EU citizens are not only visa-exempt but are legally entitled to enter and reside in each other's countries. The Citizens’ Rights Directive (also sometimes called the "Free Movement Directive") defines the right of free movement for citizens of the European Economic Area (EEA), which includes the three EFTA members Iceland, Norway and Liechtenstein plus the member states of the EU. Switzerland, which is a member of EFTA but not of the EEA, is not bound by the Directive but rather has a separate bilateral agreement on free movement with the EU. As a result, de facto, a citizen of an EFTA country can live and work in all the other EFTA countries and in all the EU countries, and a citizen of an EU country can live and work in all the EFTA countries (but for voting and working in sensitive fields, such as government / police / military, citizenship is often required, and non-citizens may not have the same rights to welfare and unemployment benefits as citizens). Since each EFTA and EU country can make its own citizenship laws, dual citizenship is not always possible. Of the EFTA countries, Iceland and Switzerland allow it (in Switzerland, the conditions for the naturalization of immigrants vary regionally), but Norway only in exceptional cases, and Liechtenstein only for citizens by descent, but not for foreigners wanting to naturalize. Some non-EFTA/non-EU countries do not allow dual citizenship either, so immigrants wanting to naturalize must sometimes renounce their old citizenship. See also multiple citizenship and the nationality laws of the countries in question for more details. The Portugal Fund was came intooperation in February 1977 when Portugal was still a member of EFTA. It was to provide funding for the development of Portugal after the Carnation Revolution and the consequential restoration of democracy and the decolonization of the country's overseas possessions. This followed a period of economic sanctions by most of the international community, which left Portugal economically underdeveloped compared to the rest of the western Europe. When Portugal left EFTA in 1985 in order to join the EEC, the remaining EFTA members decided to continue the Portugal Fund so that Portugal would continue to benefit from it. The Fund originally took the form of a low-interest loan from the EFTA member states to the value of US$100 million. Repayment was originally to commence in 1988, however, EFTA then decided to postpone the start of repayments until 1998. The Portugal Fund has now[when?] been dissolved. ^ a b c "Report for Selected Countries and Subjects". www.imf.org. ^ a b c "1949-BULLETIN-10-WEB" (PDF). Retrieved 2017-05-08. ^ "The European Free Trade Association". efta.int. efta.int. Retrieved 12 December 2014. ^ "EFTA through the years". efta.int. 2014. Retrieved 13 April 2019. ^ "European Free Trade Association by Shobicka Mehanathan on Prezi". Prezi.com. Retrieved 2017-05-08. ^ "Finland: Now, the Seven and a Half". TIME. 7 April 1961. Retrieved 18 July 2009. ^ AFP in Reykjavik (2015-03-12). "Iceland drops EU membership bid: 'interests better served outside' union | World news". The Guardian. Retrieved 2016-08-17. ^ a b "Iceland". International Monetary Fund. Retrieved 17 April 2013. ^ a b "Norway". International Monetary Fund. Retrieved 20 April 2012. ^ a b "Report for Selected Countries and Subjects". Imf.org. 2006-09-14. Retrieved 2017-05-08. ^ "Norway and the EU" (PDF). Eu-norway.org. Retrieved 2017-05-08. ^ "Council conclusions on EU relations with EFTA countries" (PDF). Council of the European Union. 14 December 2012. Retrieved 1 April 2013. ^ "Communication from the Commission to the European Parliament, the Council, the European Economic and Social Committee of the Regions - EU Relations with the Principality of Andorra, the Principality of Monaco and the Republic of San Marino - Options for Closer Integration with the EU". 2012. ^ "Council conclusions on EU relations with the Principality of Andorra, the Republic of San Marino and the Principality of Monaco" (PDF). Council of the European Union. 20 December 2012. Archived from the original (PDF) on 17 May 2013. Retrieved 1 April 2013. ^ "Norge sier nei til nye mikrostater i EØS". 19 May 2011. Retrieved 6 April 2013. ^ "Innlegg på møte i Stortingets europautvalg". Ministry of Foreign Affairs of Norway. 28 January 2013. Retrieved 1 April 2013. ^ "Eide: Bedre blir det ikke". 21 December 2012. Archived from the original on 13 April 2013. Retrieved 1 April 2013. ^ a b Aalberg Undheim, Eva (8 December 2012). "Regjeringa open for diskutere EØS-medlemskap for mikrostatar" (in Norwegian). Retrieved 6 April 2013. ^ "La Norvegia chiude le porte a San Marino" (PDF). La Tribuna Sammarinese. 3 January 2013. p. 7. Archived from the original (PDF) on 7 March 2014. Retrieved 6 April 2013. ^ "EU Relations with the Principality of Andorra, the Principality of Monaco and the Republic of San Marino: Options for their participation in the Internal Market". European Commission. 18 November 2013. Retrieved 20 November 2013. ^ "Iceland moves towards joining EU". BBC News. 16 July 2009. Retrieved 18 July 2009. ^ Spongenberg, Helena (8 October 2007). "Faroe Islands seek closer EU relations". EUobserver. Retrieved 18 July 2009. ^ "Convention Establishing the European Free Trade Association". 21 June 2001. Archived from the original (PDF) on 21 October 2009. Retrieved 18 July 2009. ^ a b "The Faroes and the EU - possibilities and challenges in a future relationship" (PDF). The Ministry of Foreign Affairs in the Faroes. 2010. p. 53. Archived from the original (PDF) on 2011-08-23. Retrieved 15 August 2013. Under its constitutional status the Faroes cannot become an independent Contracting Party to the EEA Agreement due to the fact that the Faroes are not a state. ^ "Leaving the EU - RESEARCH PAPER 13/42" (PDF). House of Commons Library. 2013-07-01. Retrieved 2015-05-19. ^ "The Latest: Lithuania says UK must say if decision is final". CNBC. 2016-06-27. Archived from the original on 2016-07-03. Retrieved 2016-09-18 – via Associated Press. ^ Patrick Wintour (2016-08-09). "Norway may block UK return to European Free Trade Association | World news". The Guardian. Retrieved 2016-08-17. ^ "Sturgeon hints the Scottish Government could seek Norway-style EU relationship". 2016-11-17. Retrieved 2016-11-17. ^ "Iceland: Scotland could not start applying for EFTA until after independence". The Daily Telegraph. 2017-03-16. Retrieved 2017-03-24. ^ "We're taking back control of Brexit, say MPs". Evening Standard. 7 February 2018. Retrieved 25 February 2018. ^ "EEA Agreement | European Free Trade Association". Efta.int. 1994-01-01. Retrieved 2016-08-17. ^ "Croatia joins the EEA". European Free Trade Association. 12 April 2014. Retrieved 11 April 2014. ^ "AGREEMENT ON THE EUROPEAN ECONOMIC AREA". European Free Trade Association. 2016-08-01. Retrieved 2017-05-08. ^ a b c d "The Basic Features of the EEA Agreement | European Free Trade Association". Efta.int. Retrieved 2017-05-08. ^ "The requested document does not exist. - EUR-Lex". Eur-lex.europa.eu. Retrieved 2017-05-08. ^ "EUR-Lex - 21994A0103(41) - EN". Eur-lex.europa.eu. Retrieved 2016-08-17. ^ "Choose a language - Consilium". Consilium.europa.eu. Retrieved 2016-08-17. ^ a b "EUR-Lex - 32014D0954 - EN - EUR-Lex". Eur-lex.europa.eu. 2014-12-30. Retrieved 2016-08-17. ^ "Free Trade | European Free Trade Association". Efta.int. 2014-09-16. Retrieved 2016-08-17. ^ "Free Trade Map | European Free Trade Association". Efta.int. Retrieved 2016-08-17. ^ "Free Agreement". www.efta.int. Retrieved 2019-02-03. ^ "Western Sahara excluded from EFTA-Morocco free trade agreement". SPS. 12 May 2010. Archived from the original on 16 May 2011. Retrieved 13 May 2010. ^ "Free Trade Agreements | European Free Trade Association". Efta.int. Retrieved 2016-08-17. ^ a b "Joint Declarations on Cooperation | European Free Trade Association". Efta.int. Retrieved 2016-08-17. ^ "Short Overview of the EFTA Convention". Retrieved 29 November 2017. ^ "EUR-Lex - 32004L0038R(01) - EN - EUR-Lex". Eur-lex.europa.eu. Retrieved 25 November 2017. ^ "What is an EEA country? What is an EFTA country?". Livingingreece.gr. Retrieved 2017-05-08. ^ "All You Need to Know About Moving to Iceland – A guest post by Jenna Gottlieb". Iheartreykjavik.net. Retrieved 2017-05-08. ^ "1976-1977 Seventeenth Annual Report of the European Free Trade Association" (PDF). efta.int. September 1977. p. 21. Retrieved 14 April 2019.